Carbonara is an Italian recipe term that means pasta that is tossed with an egg and cheese mixture. The hot pasta cooks the egg and forms a creamy sauce. This classic recipe is beloved by pasta lovers everywhere. This recipe for Carbonara Mac and Cheese combines two of my favorite pasta dishes: carbonara and mac and cheese. The rich cheesy sauce is accented with an egg for richness and with some bacon and garlic for fabulous flavor. It's true comfort food, and should be served on a cold winter night when sleet is snicking at the window. Serve this wonderful rich dish with a green salad tossed with mushrooms and avocados or cherry tomatoes and a simple olive oil vinaigrette. Some toasted garlic bread would also be a great accompaniment. A glass of wine wine or some sparkling cider would be the perfect addition to this comforting meal. Preheat the oven to 375°F. Spray a 13" x 9" glass baking dish with nonstick cooking spray and set aside. Bring a large pot of salted water to a rolling boil over high heat. Meanwhile, cook the bacon in a large skillet until it is crisp and brown; remove the bacon from the pan and drain on paper towels; then crumble and set aside. Pour off the bacon drippings but do not wipe out the pan. Add the penne pasta to the boiling water and cook 1 minute less than the earliest time on the package. 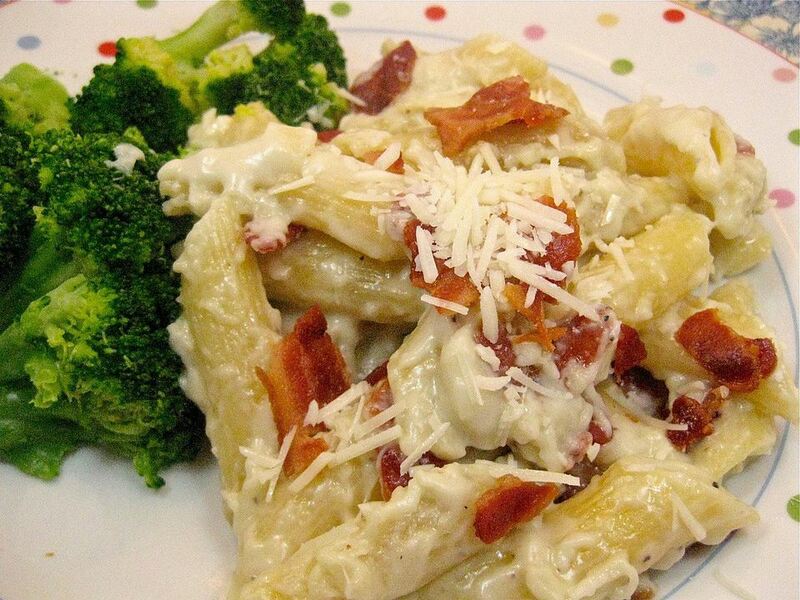 While the pasta is cooking, add the butter to the pan with the film of bacon drippings. Cook the onion and garlic in the pan over medium heat for 5 to 6 minutes or until the onion starts to brown around the edges. Sprinkle the flour, salt, and pepper into the pan with the onions and cook for 2 minutes. Add the milk; cook, stirring with a wire whisk, for 2 minutes, until the sauce is slightly thickened Whisk in the egg yolks quickly, then remove the pan from the heat. Then add the pasta and the reserved bacon and mix well. Pour the pasta mixture into the prepared dish, top with the Parmesan cheese, and bake for 15 to 20 minutes or until the sauce is bubbly and the top begins to brown.